What Day Of The Week Was March 28? 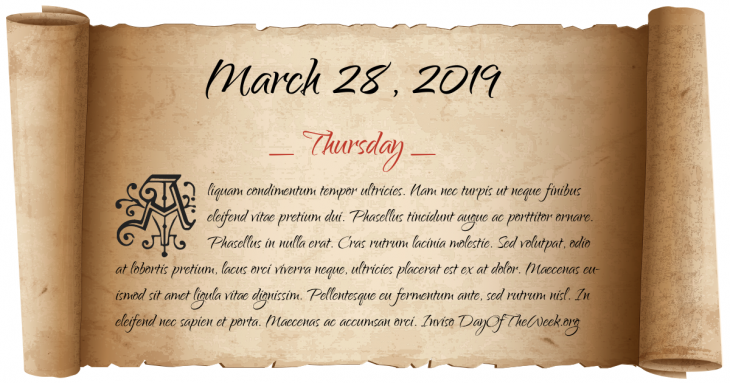 March 28, 2019 was the 87th day of the year 2019 in the Gregorian calendar. There were 278 days remaining until the end of the year. The day of the week was Thursday. Spanish Civil War: Generalissimo Francisco Franco conquers Madrid. Operators of Three Mile Island’s Unit 2 nuclear reactor outside of Harrisburg, Pennsylvania fail to recognize that a relief valve in the primary coolant system has stuck open following an unexpected shutdown. As a result, enough coolant drains out of the system to allow the core to overheat and partially melt down. In South Africa, Zulus and African National Congress supporters battle in central Johannesburg, resulting in 18 deaths. Three children are killed when a Murray County, Georgia, school bus is hit by a CSX freight train. The 2005 Sumatra earthquake rocks Indonesia, and at magnitude 8.7 is the fourth strongest earthquake since 1965.
Who were born on March 28?